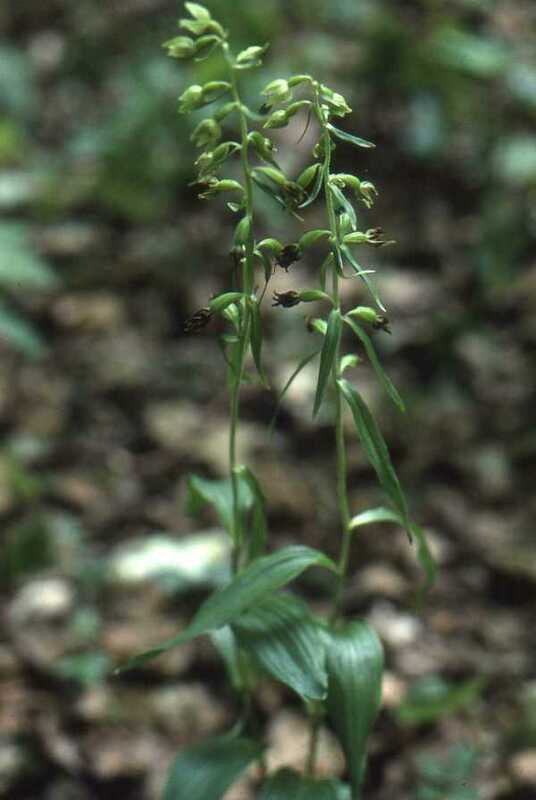 Another member of the confusing Epipactis group of orchids, the Narrow-lipped Helleborine occurs in chalk-based woodlands in central and southern England. It has also been reported from Kenfig National Nature Reserve in South Wales. This orchid can grow to 75cm in height although a range between 40 - 60cm is more common. There are between 3 and 5 bright green leaves arranged in almost opposite pairs along the stem, and within the flowers there are further long, narrow bractlike leaves which are projected outwards and then sharply downwards. The inflorescence is lax and can carry from 4 to 35 flowers, which are pale green. 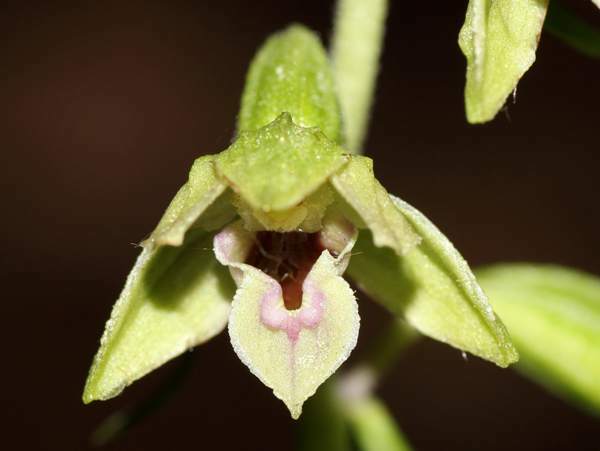 The flowers usually open fully and reveal a whitish lip that is sharply pointed at the tip and sets Epipactis leptochila apart from otherwise similar looking Epipactis species which have more rounded lips. 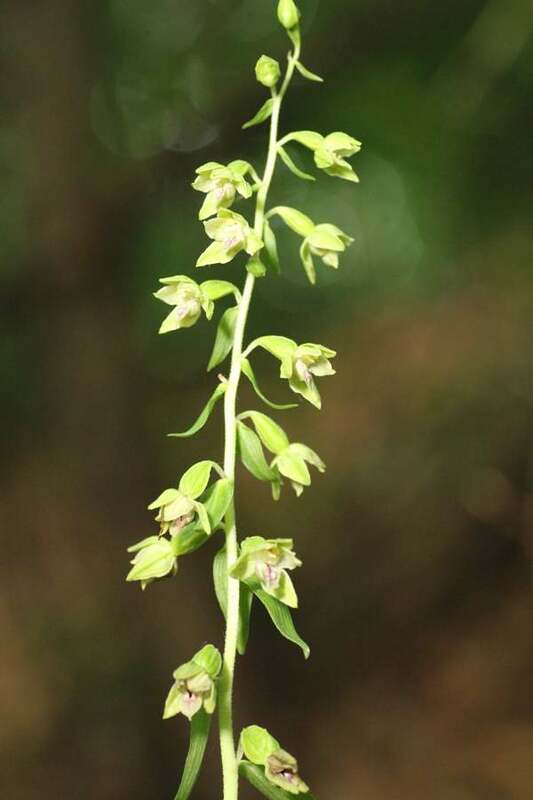 Originally thought to be endemic to the British Isles Narrow-lipped Helleborine is now recorded from other European countries where its range extends from Denmark in the north to Italy in the south. This plant favours calcareous habitats and is very localised occurring on thin soils covering limestone rock. It is mainly associated with Beech trees but also occurs under coppiced Hazel. In Scotland they are associated with Alder and Birch. Like many orchid species Narrow-lipped Helleborine colonies vary considerably in numbers with relatively few appearing some years and then large colonies making an appearance in others. This short-lived orchid flowers for around 10 days from mid-July to mid-August. The specimens shown on this page were found at Creech Hill, near Purbeck in Dorset.